Later on in the day on the 16th, the Mayor attended the Dartford District Scouts AGM (Annual General Meeting) where he - along with other members of the council - went over the past year's activities and helped to decide on the future of where the group was heading. On the 18th of June the Mayor attended the Elder's Forum, which took place in Whitstable. The forum usually takes place every three to four months in the orchard theatre, and it goes over help that can be provided for the elderly of Dartford. On the 19th the Mayor and Mayoress attended the Lord Lieutenant's Civic Reception, at his house - a mansion that has been in the family for over four hundred years, since it was given to them by the son of Henry the eighth as an expression of favour to the crown. This social event was a great way for the Mayor to socialise with other political members. On the 20th of June the Mayor and Mayoress attended the Dartford Games Golden event. This event was a follow-up from the baton-passing event previously attended by the Mayor, and featured a series of games played. 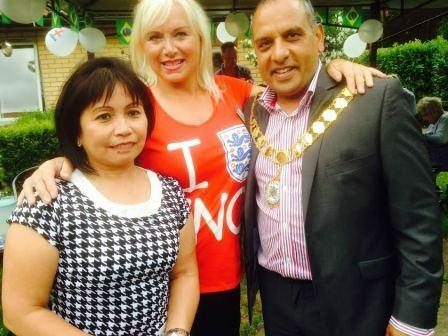 The Mayor and Mayoress attended the Christ Church's Summer Fete on the 21st of June. Church fetes are celebrations which usually feature a few different events, including festival-type events. This North Kent event was international and featured people from a few different areas - including from across the channel, in France - who came to take part in this model flying event.